Screen resolutions are getting better, and not just for televisions. Although the current standard for security cameras is 1080p, a handful of developing surveillance cameras now offer 4K video resolution. They cost more, but 4K cameras serious boost your security. 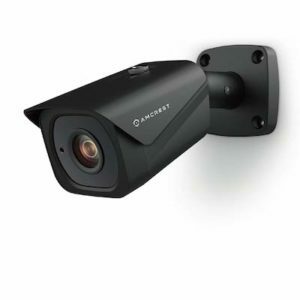 HD security cameras with 4K resolution provide four times the image quality of a 1080p camera, letting you hone in on important details like an intruder’s face or the license plate of a getaway vehicle. If you’re looking for a security camera upgrade, here are the 4K cameras we like the best. Night vision 25 ft. 131 ft. 100 ft.
25 ft. 131 ft. 100 ft.
**Standard retail prices as of 2/5/2019. Prices and availability are subject to change and can vary by retailer. 1080p vs. 4K: What’s the difference? Dimensions: 4.9 x 2.9 in. Arlo Ultra has an impressive 180° panoramic field of view, among the highest FOV we’ve seen on the market. And the Arlo Ultra has some other unique touches too, like two-way audio with wind and noise cancellation, and color night vision. We like that Arlo Ultra can send alerts to your mobile device when your camera spots people, packages, vehicles, or animals. We’re also impressed by the camera’s autozoom and tracking capabilities and how the camera can intelligently adjust to an intruder’s movements. All that upgraded technology is great, but it’ll cost you: at $399.99, Arlo Ultra is one of the most expensive 4K HD security cameras we looked at. Part of that is because it comes with Arlo’s SmartHub—it won’t work without it. The Arlo Ultra is a new entry in the world of 4K security cameras, so there are still some growing pains: some customers complain about connectivity and problems with software. But once Arlo sorts those issues, we think the Ultra has the potential to be the most versatile 4K security camera out there. Arlo Ultra is a great HD security camera if you’re looking for a no-fuss installation process, unique features, and ultrahigh-definition video. Dimensions: 8.1 x 4.1 in. The Amcrest UltraHD Bullet Camera has crisp 4K video and playback, which is impressive considering it’s one of the cheaper security cameras available. We like this camera’s long-range night vision and the option to save video to local video storage via an SD card or Amcrest’s cloud. Unfortunately, Amcrest’s cloud doesn’t support 4K playback. And Amcrest UltraHD Bullet Camera doesn’t support audio, so you won’t be able to communicate with a delivery person via two-way communication. Also, this Amcrest camera uses power over Ethernet (POE) as a power source, which can be tricky to install without the help of a professional. Fortunately, POE devices work well in areas where Wi-Fi tends to be spotty, like more rural areas. The Amcrest UltraHD Bullet Camera is a solid security camera that works well without a ton of extra features. If you’re looking for a straightforward 4K HD security camera, this is a high-value pick. Dimensions: 4.3 x 3.2 in. This dome camera may be small, but it has a lot of features: face detection, night vision at up to 100 feet, and a MicroSD card slot that supports up to 128GB of storage. The Avalonix 4K IP Dome Camera is versatile and can be mounted on a ceiling or a wall. It works indoors and outdoors. But it’s an investment. Recording video requires a compatible 4K NVR (network video recorder)—those start at $249.99. And the only compatible power sources are POE or a power adapter. 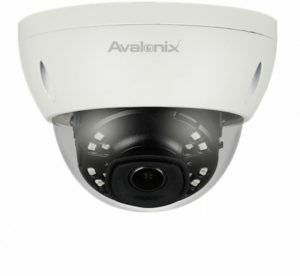 The Avalonix 4K IP Dome Camera is a heavy-duty security system that requires multiple purchases. We recommend this for bigger jobs, like large homes and apartment buildings. What’s the difference between 1080p and 4K cameras? Most security cameras are marketed as HD, with a resolution of 1080p. Resolution comes down to pixels. 1080p, or full HD, measures out to 1920×1080 pixels in a screen. But 4K, or Ultra HD, measures out to 3840 x 2160—four times the pixels as 1080p, and four times the quality. Because 4K cameras offer greater detail, they allow you to zoom in with much more clarity than 1080p. Because 4K cameras offer greater detail, they allow you to zoom in with much more clarity than 1080p. You’ll be able to access details like license plates or a person’s features. But be ready to invest. To view the 4K footage, you’ll need a 4K-compatible screen, which may mean upgrading your phone. The 4K video also takes up more bandwidth and storage. If the clearest picture isn’t your highest priority and you’d rather not spend that much, a security camera with 1080p has a clear enough picture to satisfy. We’ve rounded up the best doorbell cameras, the best outdoor cameras, and the best security cameras that will help keep your home secure. Because the technology of 4K is so new, most security cameras max out at 1080p. Once we found a good selection of ultra HD security cameras, we focused on functionality: night vision capabilities, field of vision, and any special features worth noting. We also looked at reviews of both the products themselves and of their respective brands. 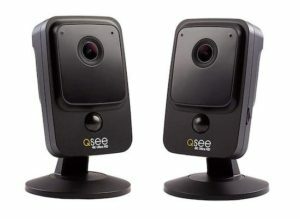 Q-See’s 4k Wi-Fi Cube Camera has 16x digital zoom for enhanced image clarity, passive infrared (PIR) heat-sensing motion detection that reduces false motion alerts, and night vision up to 30 feet away. But there are too many user complaints of Q-See’s weak software and poor customer support for us to recommend it. For most people, a 1080p surveillance camera will do the job. But if you need a 4K security camera, we recommend the Arlo Ultra for its versatility and user-friendliness. We like its thoughtful approach to improving security camera basics, like adding noise reduction to two-way audio and including autozoom and tracking. If you can wait out some of Arlo Ultra’s growing pains, it’s a great HD security camera. >>Get the ultra HD experience. 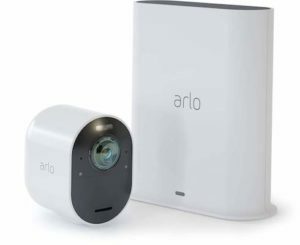 Buy the Arlo Ultra from Amazon here.